England has long been a popular tourist destination for North American visitors. In 2015 around 1.6M¹ Americans and Canadians chose to vacation in England and that figure is set to rise in 2016. For many committed Anglophiles, London is still their target destination, but increasingly more and more US visitors are venturing further afield and discovering the wonderful sites and cultural experiences that lie in store across beautiful rural England. For any UK visitors please visit our Warwickshire Holiday Cottages page. For Americans wishing to immerse themselves in England’s cultural and history, the county² of Warwickshire is hard to beat. 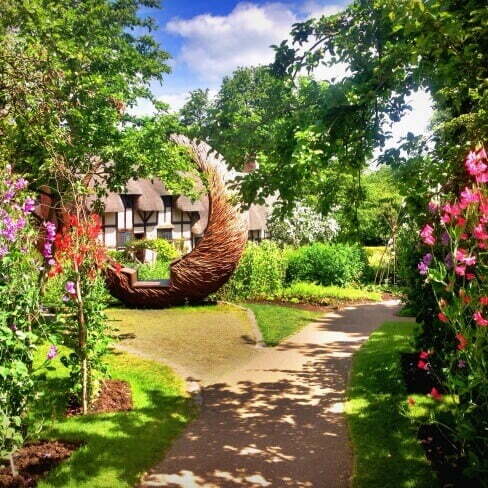 The area covers around 762 square miles and is renowned for its many splendid historic houses, its two wonderfully preserved castles and as the birthplace of probably the world’s most famous playwright; William Shakespeare. Warwickshire can be reached from London in just 80 minutes by car and 70 minutes by train, and is under half an hour’s drive from Birmingham International Airport. The enduring appeal of Shakespeare (or ‘The Bard’ as he is often known) has resulted in the town of his birth Stratford-upon-Avon, becoming a tourist mecca with a fine selection of museums, old buildings, antique and curio shops, cafes, restaurants and pubs – not to mention the internationally famous RSC Theatre. April 2016 marked the 400th anniversary of Shakespeare’s death, which was marked by a series of special events which attracted even more tourists into the area. Warwickshire is packed with the type of quintessentially English things that are so beloved of our international visitors. The county boasts dozens of pretty villages with charming cottages, traditional pubs and beautiful countryside, and visitors can stop off along the way for a traditional ‘cream tea’ of scones with cream and jam at one of the many quaint Tea Rooms dotted across the county. One thing that we Brits can be rightfully proud of is the tremendous effort we put into preserving our wonderful old buildings and Warwickshire can boast hundreds of fine examples of properties dating back centuries. Our two fantastic castles; Kenilworth Castle and Warwick Castle are magnificent monuments to times gone by, offering visitors a memorable insight into what life was like for previous generations. We are also extremely good at protecting buildings that have architectural or historic merit and many of our older residential properties will have a ‘Grade 1’ or ‘Grade 2’ Government awarded listing, recognising their significance and preserving them from structural change. Warwickshire is packed with stunning examples of old buildings constructed from traditional materials and methods including timber framing, wattle and daub and thatched roofs, and many of these fascinating properties are available as vacation rentals. One thing that sets Warwickshire apart from other more densely populated areas of England is its abundance of lush green countryside. The area typifies “England’s green and pleasant land”, with breath taking vistas, uninterrupted views and miles and miles of stunning unspoilt countryside, with not a city or high rise building in sight! There’s so much more we can tell you about our fabulous county, so please feel free to drop us an email and we’ll be more than happy to share our knowledge with you or offer you recommendations for your forthcoming vacation in Warwickshire. ²The term ‘County’ refers to a geographical area. England is divided into 48 counties, which are a bit like US states – but on a much, much smaller scale!